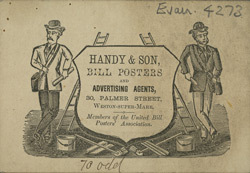 This is an advertisement for Handy and Son, bill posters and advertising agents. During the 19th century posters were not subject to the same advertising tax as newspapers and so they were a cheap way of advertising a product. Colourful and striking images could be used to catch people’s attention and bill posting firms such as Handy & Son, would employ men to stick posters in every available place. At one stage there were so many companies putting up posters that they became a ‘public nuisance’ and the Metropolitan Paving Act was enforced to regulate where adverts could be posted.